If you think real-world relationships are tough, you should try you getting married in MapleStory, an online RPG with a divorce rate of 75 percent. 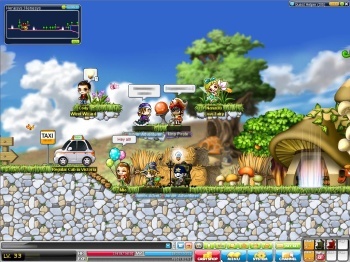 "Love stinks," as J. Geils once pronounced, and nowhere is that more true than in MapleStory, a free-to-play MMO where the rate of failed marriages is so high that Nexon, the publisher, reached out to its users to find out what's going on. 26,982 in-game marriages were performed in North America last year; 20,344 - 75 percent - ended in annulment. "I was young, naive, and thought I had met 'the one.' She asked me what I wanted in MapleStory for my birthday, and I told her that the only thing I could ever want was for her to marry me," said 20-year-old Tyler. But soon after the ceremony, things started to go south. "She started saying that I wasn't the person she fell in love with. That I had changed, and that I didn't seem to care about her anymore," he continued. And then she threw his stuff out onto the lawn. "I got a call from my best friend, saying that all of my items were dropping. It was her. Less than a week later, we decided that we needed to sever all ties between us, and we had our marriage annulled. I haven't talked to her since." And his is not the only tale of woe. 19-year-old Seth told of how his marriage collapsed after he figured out that she was only into him for his money. "I realized after a while that she was only out there to get free things off of me and we got in this conversation where she admitted to this accusation," he said. "So I decided I would have to annul our Maple marriage." On the upside, as producer Crystin Cox pointed out, MapleStory divorcees aren't on the hook for alimony or child support and they don't have to go to court to divvie up their loot and items before they go their separate ways. But the bad news is that it costs 25 bucks to get married in the game, and broken vows of eternal love carry a strict "no refund" policy.